After the recent failure of one of my Peerless HDS134 midbass I decided to reuse the XT25s and build your Ellam XT. I had wondered whether to just buy a 5 inch Nomex or PBB but the Scanspeak Revelator caught my eye and I took the plunge. I'm glad I spent the extra as these little drivers have given me a sound that I've not heard before. The clarity is superb and the midrange dispersion is great. You had advised me that I would notice an increase in bass and you were not exaggerating. They sound like a floorstander and can produce more volume with grace than seems possible for such a small driver. This is only my 2nd build of one of your designs but again it is the vocal quality that impresses me most. The weight and tone of vocals both male and female seems very natural. I am also impressed with how dynamic they sound for a low efficiency design. I am using Hypex 400 monos so there is lots of control but they leave the older Peerless units some way behind in this respect. The grilles have yet to be finished properly as the cloth is only held on with tape at the moment. The veneer is glue on birch ply and I'm really pleased with how it turned out. Lots to learn but I'm sure things will improve as more designs get built. Please feel free to include any of these pictures on your website. My next build will be some larger speakers for the lounge and a real bonus is her new found faith in me to make a decent job of the boxes that I make. I have approval for a shortlist that includes the Peerless Nomex and (very surprisingly) the Classic 3 Way. 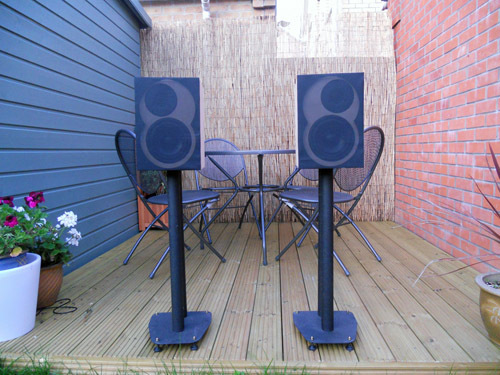 I have wondered whether these cheaper units will live up to the midrange clarity of the Revelator but I am looking for a design with more authority in delivering the weight and scale of an orchestra. Small drivers can as you say only do so much. 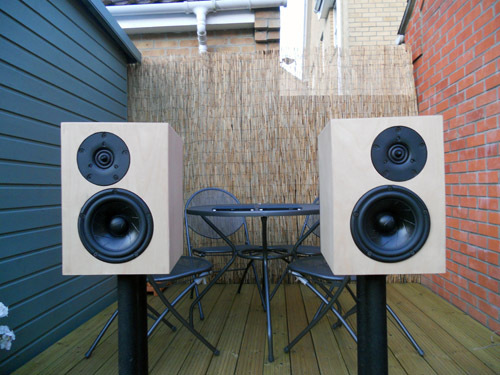 My own very basic attempts to build a design was to get hold of some cheap Peerless 8 inch units and I put them into a 45 litre cabinet paired up with a Vifa tweeter. Not sophisticated but huge fun on my friends Krell KSA 80. The Dracula: (So called as they were only allowed into the lounge at night when my wife had gone to bed!) In fact they are the only speaker that she has physically removed from the house. The cabinets were very rough chipboard that left a trail of chippings wherever they had sat so she had a point. I would appreciate your comments on the Peerless Nomex and the Classic 3 Way - my head says that the 3 way with its dedicated midrange driver, larger bass driver and bigger cabinet would give me that more authoratitive sound. I am not sure however over the characteristics of a 2.5 design over a proper 3 way. As always you have my thanks and I hope you and your family are well.